The island although small had a very important role from ancient times, it was used as a base of naval operations and a point of rearmament. During the Greek War of Independence, Agistri fought hard for freedom but the islands didn’t became truly independent until 1835. Agistri has three main villages Megalochori also known as Mylos, Skala, and Limenaria. Skala Village is the island’s main port and where most of the tourist facilities, hotels, taverns cafes and clubs are located. Skala beach is very popular thanks to its shallow waters and soft sand. It is also the most organised beach on the island, ideal for relaxing, enjoying the sun and admiring the blue dome of the most photographed church on the island, Agioi Anargyroi. 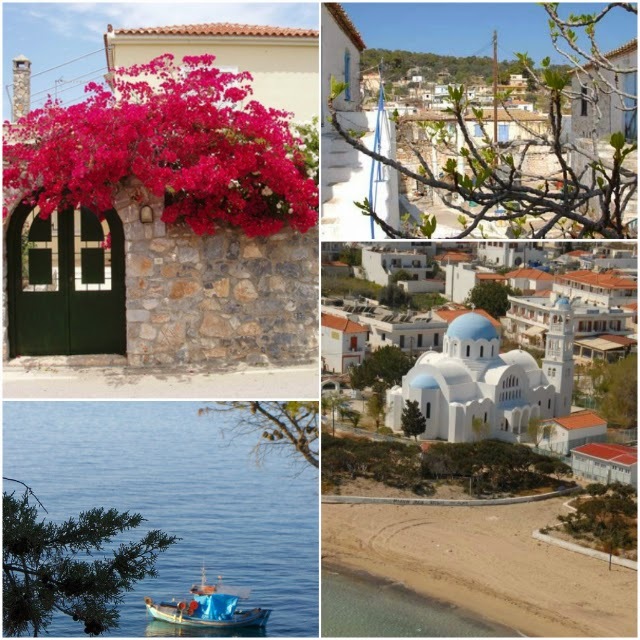 West of Skala is Megalochori, Agistri’s capital, where you will find numerous tourist shops, hotels and taverns. A walk through the nostalgic alleyways of traditionally built white houses and colourful gardens will end up near Zoodohos Pigi church; the islands’ Cathedral. It is certainly worth a visit for its beautiful murals and visitors and locals are always impressed after stopping by. Only 5km away, you will find Limenaria, a very small village filled with pine trees, traditional stone houses and magnificent views of the sunset or sunrise. Go early in the morning to have a cup of Greek coffee in the traditional café-tavern. You will find it easily by following the mouth-watering smell of freshly baked bread coming from the old bakery. This is a memory that will keep you warm even on cold winter days. Even though it is quite small, the village has two great taverns offering local favourites and delicious fresh fish. Extra insider tip: Buy handmade fabric, or high quality olive oil made by the locals and herbs like oregano; the fragrance of which fills the cosy taverns. For transport around the island, there are taxies and buses you can use. However, we suggest renting a motorbike or even better, a bike, in order to discover parts of the island that cars or busses cannot reach. Use it as a way to meet and have fun with the locals. Or visit the spectacular Metochi Village over a cliff. It offers a spectacular view, especially from the small church of the Virgin Mary on the highest part of the cliff. It’s tiny too, with only one family-run restaurant serving delicious fresh fish and local flavors. Agistri is a paradise! A pine covered island ideal for anyone who wants to enjoy the sun, explore exotic beaches and crystal-clear waters. It’s a perfect place to relax and rejuvenate away from the city’s hustle and bustle.